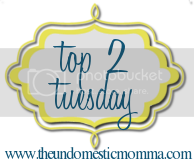 I'm linking up to The Undomestic Momma again this week for my top 2 drinks! I love Pepsi. Seriously. Love. Especially in the fountain drink form. There is nothing like it. And there are just certain meals that warrant a Pepsi; Mexican, pizza, etc. This is hands down my favorite seasonal drink. From mid-October until the end of the year, this drink truly and honestly makes me happy. It just warms your soul! What about you? What's your favorite drink?